History will be made. Various people from around the world and organisations from Yorkshire will gather for the launch of a new book. 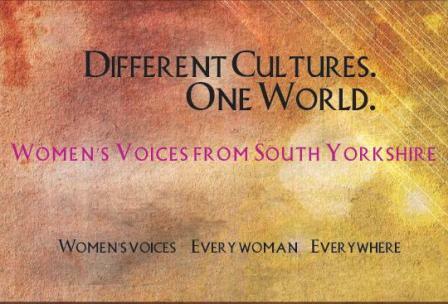 This celebrates the achievements and experiences of a diverse group of women living in South Yorkshire. “One World. Different Cultures. Women’s Voices from South Yorkshire” will be published as part of the “Off the Shelf” annual writing and reading festival. The launch of our new book and webpage of poems, stories and other pieces (such as recipes for a better world) will take place at the Quaker Meeting House in Sheffield, 11th October 2010 at 1.00pm to 2.30pm. This work was collected together through writing workshops with the poet RiverWolton. The project is part funded by DfID, The Helen Tetlow Memorial Fund, Northern Refugee Centre, Northern College and Sheffield City of Sanctuary. Copies of ‘Women’s Voices’ will be on sale at a special festival price. The proceeds from the sale of the book will go towards the support of the DEWA Project. This event is free but booking is advisable. Please email: pdaniel@northern.ac.uk to book. ← Now we’ve started writing, we can’t stop!